It's Sunday morning in the UK and the first signs of cryptocurrency price recovery are appearing. Because I am on a train, creating a video today is difficult if not impossible. However, I noticed a few things on the charts that I wanted to share so rather than all or nothing, I decided to go the middle way, break the mold and do a written post today, which I almost never do. Notice how the most recent fall in price from $20,000 came right back down to this trend line to touch it for the 3rd time. With a high degree of confidence that this would be where the price would turn around, I converted some Great British Pounds (GBP) into crypto at this point. I was not expecting to catch the very bottom, that's an unwise approach. Instead I did my analysis, decided how much I was willing to risk and then took decisive action. What stops most people from actually placing trades is the fear of making a wrong call. That is the wrong mindset. There is no amount of analysis that will guarantee a profit. There is always the possibility that you will be wrong, in fact its inevitable and thus must be accepted as part of the job. Wayne Gretzky wasn't afraid of taking the shot and missing, in fact he missed more shots than he scored and became one of the greatest. What Happened After I Bought In? 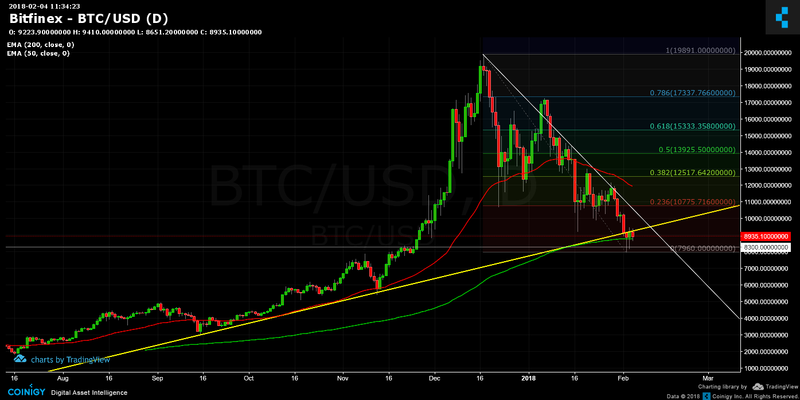 Here is a close up of where the Bitcoin price is now on the daily chart. The yellow arrow points to the day I got in. I bought 8 different coins on this day including Bitcoin and I'll reveal my choices later in this post. You can see the market went lower after I got in, which doesn't concern me. 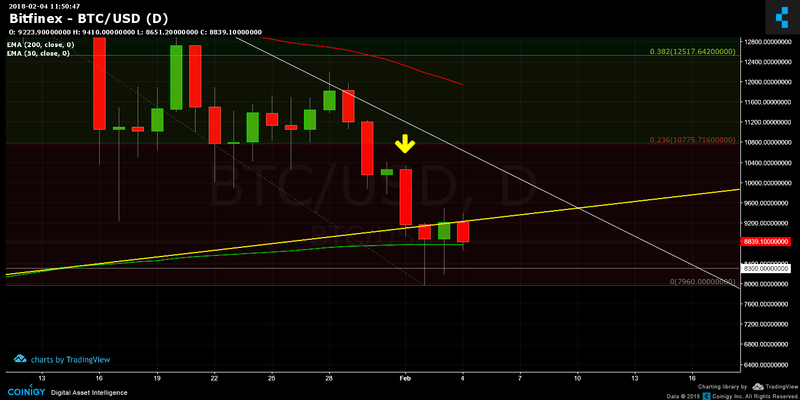 What we see is that medium term trend line in yellow has now turned into resistance. 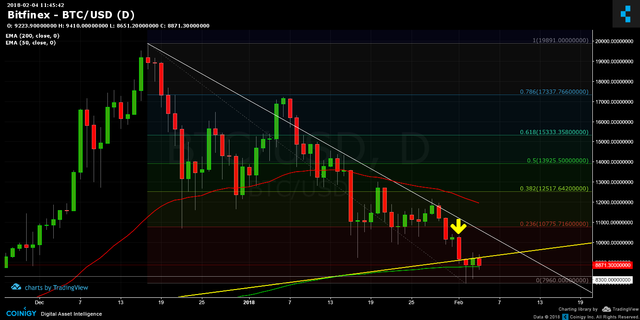 Here is an even closer view that shows the price is now stuck under the trend line. Notice also how it is sandwiched between the yellow trend line and the 200 day Exponential Moving Average (the green line). What is encouraging to me is that the tails on the candles are getting higher, which is a sign that buyers are willing to pay increasingly higher prices for Bitcoin. That is what is preventing the price from going lower. It also likely means that the vast majority of the people that wanted to sell their Bitcoin in a panic have done so. Prices can rise because of 2 scenarios, an increase in buyers or a decrease in sellers. Sometimes both happen at the same time. This also applies in reverse when prices fall. What Did I Buy And Am I In Profit Or Loss? Some people don't like this tool because it's centralised and the website owners have access to the data but that doesn't particularly bother me. Just consider that before using it yourself. This is obviously changing by the minute and overall I'm down 2.5% across the whole set of positions. Mostly thanks to NEO but LiteCoin is saving the day. This proves that I entered a day early but I am fine with that. I got in at what I consider 'low enough' prices to make excellent profits in the coming weeks. That is assuming we have hit the bottom. There is still a chance we break lower again but I accept that risk. I think it's unlikely, however I will not blame anyone if it does break lower. I accept full responsibility for my trading decisions win or lose, and you should too. I have removed the actual amounts from this post because that information is private. However what I will share is that I put an equal amount into each coin. It is a good job I did equal trade sizes because otherwise LiteCoin would not have been able to bring the average up. As luck would have it, between my Ledger Nano S and my KeepKey, I was able to withdraw all my coins from exchanges after I had bought them and sent them to my hardware wallets. Yes this means it will take longer to transfer them back to the exchanges when I want to sell and take profits, however I rank security at the top of the priority list. To me security is even more important than speed or maximising profits. I say that because a security breach can result in a 100% loss of your money without the markets having to crash. If I lose money in crypto, I want to make sure it only ever happens because of a price movement outside of my control, rather than because I had poor security and someone stole my money. One of the things I like to emphasize, especially to people wanting to get into crypto is the question of "why are you doing it?" More specifically "What do you want the money for?" This is a question you need to answer before you do anything. What is that thing you really want to do that money can get you? Do you want to pay off your mortgage? Do you want a round the world cruise? I don't care what it is, I care that you know what it is. Once you know what it is, figure out exactly how much that thing costs TO THE PENNY. Write it down. Then and only then should you begin your journey into crypto. This is critically important because at all times you will know WHY you are doing it. What gets on my nerves is when people online post one word responses like "HODL", to which my response is "HODL until when? Until you are on your death bed???". If you don't know when to sell, you will hold forever, and you will never actually achieve your dreams. I believe the number of people whose dream is to "have x amount of crypto" is very small because we only want X amount of crypto because that means we then have enough money to do that thing we have always dreamed of doing. I'm sharing these thoughts with you here because this set of coins I bought in the latest crash was done with this exact philosophy. The profits I am going to make on these trades are for something very, very specific that I have listed in a spreadsheet, each with prices listed individually and then added together. That becomes my profit target. When that profit target is reached. I will sell and do that thing I want to do. Don't be a graveyard HODLer. Set a goal, write it down, keep it in mind and then allow crypto to help you get it. Always look forward to your insightful content every morning! Sunday post is a bonus! Absolutely agree with your assessment and it is like dollar cost averaging into a position. One question I have is how to you get out of a bad position? Would you get out based solely on price action or on actual fundamentals? Also, for gains, do you also scale out or sell the whole position when you achieve the goal? I use a hybrid approach in that I hold core vs trading positions and will scale into both but sell out of trading postions when a target is achieved. Your thoughts will be great! Safe travels! I personally only take out of my core positions when I want to diversify my core long term holds as for trades when I'm done I take it all and typically look for the next trade in the efforts to compound my earnings. However I usually leave some on the side from each win to put back into the core position so both aspects of the portfolio can grow safely. You make the decision when you will get out before you get in. You plan the trade entry and exit points and then don't change your mind in the middle of a trade. My strategy depends on the market conditions at the time. Nice overview. Thank you for taking us through your thought process. It's a valuable exercise everyone should do. And also write it down, so you're able to look back at your reasons whenever you're questioning your motives. Your written post is much appreciated. Great post! My immediate objectives are to be able to buy a place and to be able to pay for those expenses for a year or to make enough money to be able to rent for two years plus expenses. Next I wold like to make enough for a car, my jeep needs some and it may be easier to just get something new by the time I would actually do it. Third goal is to raise enough money to facilitate to start a business, the ideas I have in mind are costly up front and should require a decent amount of labor. These are some of the reasons I am in crypto, but I do plan to HODL long term as well, always have some savings and have those savings diversified to mitigate ones risk. Again thank you for your posts and keep up the great work! This so helped reinforce the lesson on exponential moving averages that I studied yesterday from your Master Trading Course. Perhaps more importantly was the lesson you give here - having purpose for trading in the first place. All your lessons about cryptocurrencies and blockchains include the considerations of risk, security, goals and life in general. Your life examples have shown me that cryptocurrency is about living life even as it disrupts the world we are in. And that is a good thing. I think your idea of setting a goal and selling when that target is made in order to fund your dreams is one of the most important messages I've seen in crypto trading yet. Cash out when you have enough to do what you want to do. I did this in a very small scale recently when I decided I had enough in my Steemit account to allow me to write for three months full-time with an aim to finally getting published. At that point I cashed out. Chase your dreams, that's what life is all about. Surprised to see no ETH as this remains a major platform play with deep liquidity. I used ETH as the currency to buy alts. You have summarized beautifully a lesson this recent crash has taught me. Enjoy the train ride! Fantastic read!! I've been following the same philosophy and it's always given me peace of mind when making buys. I do need to work on my "HODL 'til when?" answer though. Thanks for your unique perspective on this Chris. Do you have a link to your TradingView or Coinigy Chart? Time to buck the trend and make Feb Cryptotastic ! Nice post Chris! 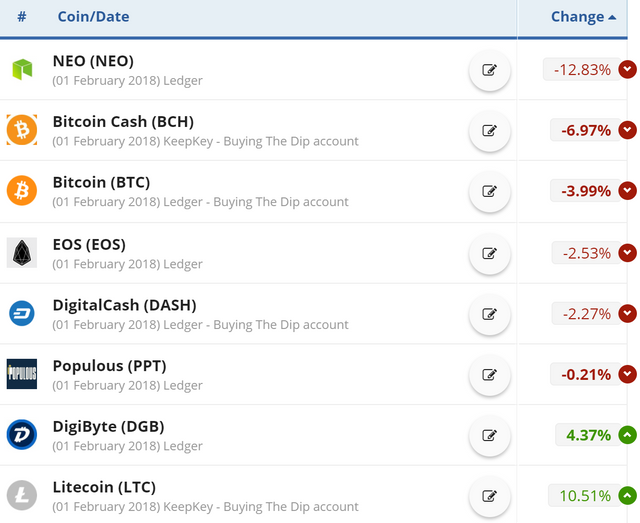 Both Cryptos and traditional markets seem to be undergoing a correction with Cryptos leading the way (closer to bottoming). I'm interested in hearing your reasoning for choosing the 8 assets that you did. Any thoughts? That's not a straight forward answer I can give in a comment. Sir, I like your portfolio, however I must ask: Why no ETH? Thanks for sharing your knowledge its good for a newbie like me. I have a question about Bots doing trading for us. I am following Mike Klinger and he suggest using Bots for trading could be a good idea. What are your thoughts on this? Should i use Bots for trading?